My 5 year old daughter is a collector. Okay, she is probably a future hoarder. She loves putting things in her "collections" and one of those treasures is erasers. She loves those colorful, unique erasers not so much for erasing but for pretend play, counting and more. This gave me a great idea for music class! I decided to use the 16 block grid as a means for students to create and organize rhythm patterns based on the erasers. I talk a little bit more about the grid and the lap packs they are used with in THIS blog post. At this workstation, students choose an erase and put it in a square. Then, students decide what to call the eraser. They can be creative with this part (and often are!). When they decide what to call the eraser they write the name under it. In this picture they actually put it in the second row, but usually we put it in the same box as the eraser. 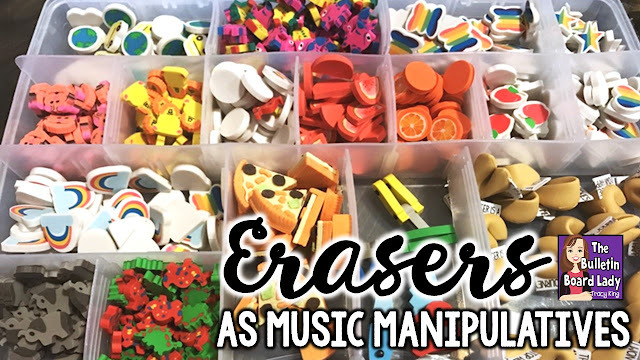 Students can be creative in naming the erasers depending on the rhythms they know or want to use. For example watermelon could be called "fruit". Pizza could be "slice" or "piece of pizza" or "veggie pizza". This works are a means of differentiation. Students can make this as difficult or as easy as they like. After they have created the rhythms, they share them with their group. I use this activity as part of a workstation rotation so there are 3-5 kids in a group. Students can then choose body percussion or a small percussion instrument to perform their rhythm as an ostinato in their group. This would also work as a whole group activity. You could write the rhythms on the board or use a document camera, erasers and grids to replicate student compositions. Then you could create ostinatos using percussion instruments, Orff instruments or body percussion to create a really fantastic piece. In addition to using the erasers for rhythm practice you could also use them with a staff and do melodic dictation using the erasers as note heads. This would be particularly fun if you had erasers to match the theme of a song. For example, fish while listening to "Aquarium" from Carnival of the Animals or Jack-o-lanterns while listening to "Night on Bald Mountain would be fun to create an activity around. 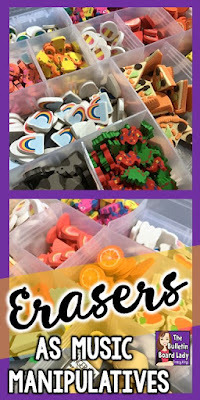 I hope that you have been inspired to try mini erasers in your classroom. I also hope that I haven't created an addiction for you! I have already started collecting erasers for Halloween, Christmas and Easter! I think this is a great way to use different items to create rhythms. I used "dogs" and "birdies" so often for my preschool practicum, and I think this would be an amazing way to keep things interesting, especially when doing activities like this with older students!